News broke today that the Islanders will play a preseason game against the Devils at the Barclays Center in Brooklyn next season, and in and of itself, that's not much of a story. Preseason hockey is, well, preseason hockey, and it's not terribly uncommon for teams to play the occasional preseason game at an arena other than their own. Of course, this is about more than a single preseason game. For those who haven't been following along, the Islanders' Nassau Coliseum lease is up in 2015, and their future beyond that date is unclear. Last summer, Nassau County residents voted against a plan that would have allowed the county to borrow $400 million to construct a new arena for the Islanders as well as a minor-league ballpark. And without a new arena in place on Long Island, owner Charles Wang could begin to explore his options. That could mean any number of things, including relocation to, say, Kansas City, or Quebec City, or wherever. 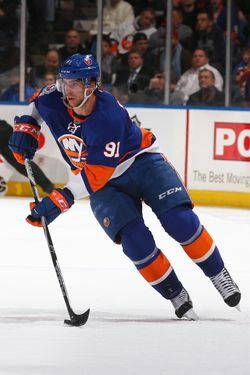 But a move to Brooklyn has been an intriguing option ever since Barclays Center officials announced that the arena could indeed be configured for professional hockey. We've always considered a move to Brooklyn something of a compromise. In a perfect world, the Islanders would remain in Nassau County, but in that perfect world, the Islanders wouldn't be 27th in the NHL in attendance, and the team (despite some talented young players) wouldn't live near the bottom of the Eastern Conference standings. Perhaps we shouldn't speak for Islanders fans — we've cheered for the Rangers our entire life — but if a new arena in Nassau County isn't a possibility, we'd imagine they'd prefer to see their team move a couple of counties over, as opposed to seeing them move halfway across the country (or perhaps even out of the country entirely). He's talking about the game next fall, but he could just as easily be talking about something much bigger than that. Come 2015, it might not be the perfect landing place for the Islanders, but as far as their fans are concerned, at least, it might be the best one.